With the advent of circular economy, enterprises have no longer given priority to the economic benefits, but also focus on social responsibility and sustainable development. In order to accelerate the ecological change of enterprise system, every enterprise vigorously carries out green technology innovation and development. Therefore, how to evaluate the performance of ecological cycle has become a problem for management personnel. This paper takes Baotou steel group as an example, which is one of the largest steel companies in China, and establishes an ecological cycle performance evaluation index system from the aspects of economic operation, resource impact control and ecological circulation innovation. Based on that, the entropy-topsis model is used to evaluate the performance of ecological cycle in Baotou steel group. Through the evaluation, we find out that the ecological cycle performance of Baotou steel rose before 2010 and still at the middle and primary stage of its eco-cycle development. 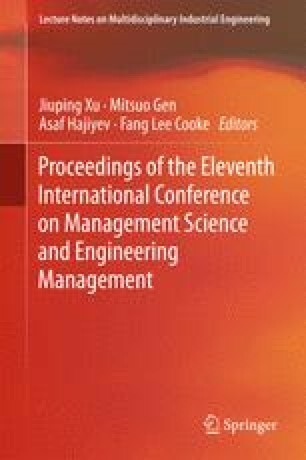 The results show the evaluation index system and method can help management personnel to realize the status of their company’s eco-cycle development. It also can help policy makers to make better green policies and strategies, promoting the eco-cycle transformation in China. This work was supported by the National Natural Science Foundation of China (Grant no. 71501019, 71501138, 71601164 and 71371130), Youth Program of Social Science Research of Sichuan Province for the Twelfth Five-year Plan (Grant no. SC15C005 and SC15C030), General Program of Education Department in Sichuan Province (Grant no. 16SB0071 and 16SB0049), General Program of Mineral Resources Research Center in Sichuan Province (Grant no. SCKCZY2014-YB04).